Welcome to the new interview series in which Chicago’s leaders of tomorrow, UCAN youth, will interview Chicago leaders of today. 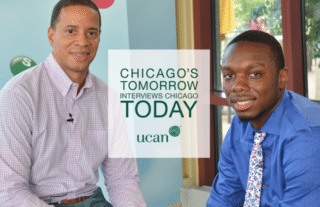 Each youth interviewer identifies a career that inspires them, and sits down with a notable Chicago figure from that field. These conversations not only explore how one gets into such work, but why and how that career is valuable to the city and its people. It’s all part of our conviction at UCAN that today’s youth, even when hit hard by trauma, can become tomorrow’s leaders. The interviewer for our inaugural episode is Ariyan Moore, currently a marketing student, who spoke with John Starkey, Global Brand Leader for Dove and Galaxy chocolates at Mars. Ariyan Moore: First, I would like to thank you for doing this. John Starkey: No, thank you. I’m excited. AM: With marketing being such a general aspect in any business, what’s your main goal at the Mars Company? AM: Of all of the different career avenues that you could have chosen, what do you feel drove you to marketing? JS: I was an Economics major so I wanted to go into business, but I also wanted to learn some skills that would help me in my journey. I started out in finance…I went through the Financial Management Program at GE to really get a foundation around understanding P & L [profit and loss], understanding how the money works. That was a great place to start…for me to understand the business, what actually drives it, and what levers you can pull to drive growth. In my role, I supported brand management and marketing teams; when I got to see what they did every day – the versatility and really the breadth of what they worked – I knew that, eventually, that’s what I wanted to do. Because it’s often important for you to get your MBA in marketing, I went to the University of Michigan to get mine – and I’ve been doing this for many years ever since. It’s the variety of challenges, and the ability to collaborate with a cross-functional team to get products to the marketplace – that’s what makes it fun. And being a former athlete, I love teams. As the leader of the team, you work with different types of people to get everything you need to get done in marketing. I love working with people when they’re very good at something that I’m not good at, and seeing how the collection of skills we put together really can make magic in the marketplace. AM: What do you feel are the different skills you need to lead a successful marketing team, and how can you hone those skills once you get in to business? JS: That’s a great question. As I say, a lot of what you do in brand management is leading teams, so understanding how to manage a project, understanding how to build timelines and pull together key inputs on those timelines from various sources is critical. You are the conductor, and if you want to make the train run it’s really important for you to be able to let the team know what they’re specifically accountable for, when they’re accountable for it, and to keep them on task (but to do it in a way where, many times, you’ll be influencing without authority…which is another skill). One factor that’s exceptionally important is strong communication skills. I don’t mean only being able to dig into the details, but to communicate simply and clearly so that people understand where we are going. And you also need to communicate your vision to the organization, as well as to customers when you’re in front of them, or even to the industry as a whole, as you have the potential to be spokesperson for your business in the marketplace. So communication, project management, and influencing without authority are three key skills; plus, strategic agility and a results orientation. I’d day those five things are some of the critical skills that are required to be successful in this field. AM: What qualities do you look for in someone who wants to work for your corporation – especially someone trying to get their first job? JS: First and foremost, passion. Nothing gets other people excited than somebody who’s passionate about what they do and has a clear vision and a desire to come in and make things happen. So you’re going to need somebody who can bring the energy, bring that commitment, that passion, and have it rub off on other people. That also means someone who’s a strong leader, with a history of being in leadership positions, and who hasn’t been afraid to be the voice or face of a team or an organization. Of course, you want someone with real intellectual horsepower and a history of academic achievement. But you also want to look for somebody who’s shown the ability to overcome obstacles and learn from mistakes, growing and developing based on those mistakes. Nobody is perfect here. You have to have people within your organization who show resilience, show the ability to learn, adapt and adjust. A track record of those leadership capabilities and skills is what we look for. AM: You’ve built a career in marketing, obviously doing something that you love, but is there still stress that comes along with that? Or does the love for what you’re doing always overshadow the stress? JS: There’s obviously going to be stress in anything that you do, particularly when you feel accountable for not only your business, but your people, your team, and the results you need to drive. I would say that it balances out. There are always aspects of the job that are tough, and you’re going to run into situations that you didn’t expect. There will be times where you have to motivate the team or pick it up after some challenges. But you do balance that out with the passion and the excitement around understanding what’s possible. I get a lot of energy from a team that, when they work together around a common goal, can deliver results you never thought possible. AM: So it’s more of a natural stress that comes with trying to be great at anything? AM: What are some things that I should be doing now that can best prepare me for my marketing career in the future? JS: Get as much broad learning as you possibly can in core academic areas. You want to be strong quantitatively, so don’t shy away from taking Math courses. Also, look at Economics and Business courses for fundamentals. And because marketing is really about understanding people, understanding trends and the like, take a broad course set. Take Government courses, History courses, Art History courses. Take courses that line up with your passions – and do as well as you can. We want people who show a history of academic success. The other thing I would tell you to do is look for as many leadership opportunities or collaboration opportunities as you can in college. Get involved in various student organizations, and take leadership roles. Lead a cause that you’re passionate about. Those types of things really help you stand out when we’re looking at candidates to come into this field. AM: I feel like those all are great ideas, because at the end of the day, marketing is dealing with people, understanding people and showing compassion for the people that you work with and those that you’re trying to invite into your business. AM: Why do you feel that marketing is important not only to life in Chicago, but also to the future, to the younger generation of people? JS: There’s a responsibility that comes with marketing and I’m proud to say that I’ve always worked for, and I currently work for, an organization that takes the responsibility of marketing to consumers, to children, very seriously – and doing it in a way that’s ethical and doesn’t try to exploit any communities. You can think about times when there was an ad trying to target an African American community, but they really didn’t understand the African American community. We can bring that perspective, or we can learn that perspective and have a commitment to really doing our research and understanding what it takes to connect with consumers in an authentic way, regardless of if we are from that race or not. AM: With business being so competitive, what are some things your team does to stand out and say, “Buy with me,” instead of buying that other brand? We don’t market to children under the age of thirteen. We have very strong environmental and sustainability goals that are within our DNA, of how we operate and what we want to do. But we aren’t this way because of consumer pressure – this is simply the way we believe, and the Mars family believes, we should operate. We take great pride in consistently looking at innovation and communication that hits consumers at an emotional level and truly meets their needs. We over-invest doing research to truly understand consumers, to understand them now and where they’re going in the future. From an environmental standpoint, we don’t want the way that we bring products to market to have a negative impact on our environment or our society. So we initiatives like the wind farms we’ve set up that now generate enough energy for all of our factories in North America. By using sustainable energy sources, we’re not only thinking about today, but also about leaving a positive impact for our community moving well into the future. AM: So it’s about caring for the consumer on a personal level, and not only on the monetary side of things? JS: Absolutely. Consumers are expecting a lot more from corporations these days. Now they don’t just look at the product on the shelf; they also research online to see what your practices are, from hiring to the environment. There’s a greater desire for transparency from corporations now, so as consumers build a relationship with an individual product, they’re also making sure they can buy into the company that’s behind it. AM: That’s great. Thank you so much. JS: No, thank you very much. These are excellent questions. You make me excited about the future of marketing and marketing leaders, and I wish you nothing but success. Hopefully, you’ll be sitting here one day giving advice to young men and women. AM: I hope to. Thank you again.